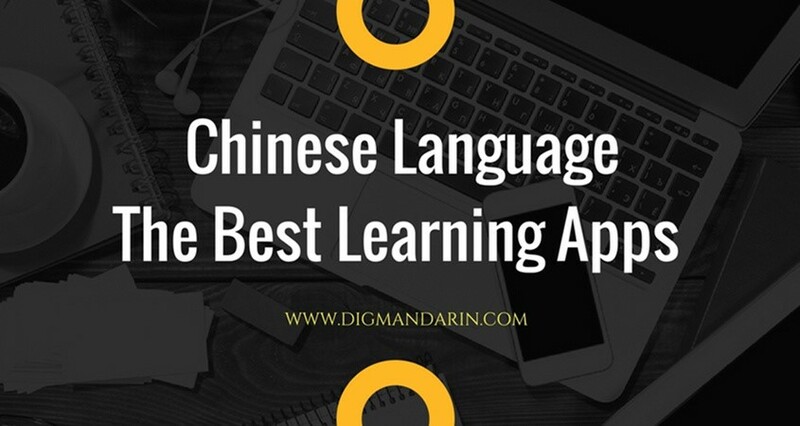 Because of technology, nowadays more and more people tend to just learn Pinyin and then type Chinese characters instead of writing them down. It indeed seems more convenient and easier. 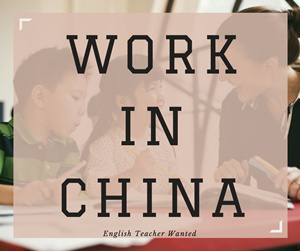 However, for a Chinese learner, writing can help you remember the characters more accurately and systematically. If you just type on a computer of a cellphone, you might go through a period when you will suddenly stop using Chinese, then it becomes so easy to forget the words because many characters are just too similar. With actual writing, your muscle memory will help you remember and master these characters much longer because they become a part of your brain. Besides, writing is also a part of understanding Chinese culture. 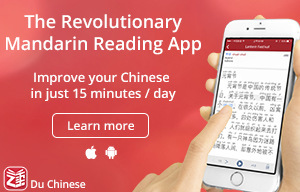 So, my answer is YES, I recommend that you learn how to write in Chinese. Answering this question is not that simple, so I`ll use the rest of this article to give my best thoughts about this. 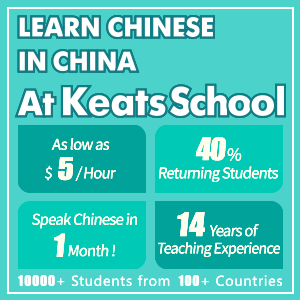 Chinese characters are relatively independent from the phonetic system. There are about 80,000 characters in total and about 6,500 which are used daily. 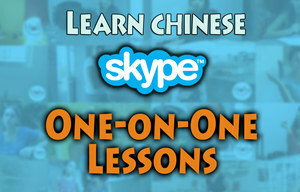 Each character has its own pronunciation, though many of them share the same pinyin syllables. The large number may make many beginners feel scared and overwhelmed. Actually, after knowing the principle of making characters and the rules behind it, mastering the writing of characters should be quite easy. It`s like a “one formula fits all” method. We all know that there are two versions of Chinese characters in us nowadays: traditional Chinese characters （繁体字）and simplified Chinese characters （简体字）. The traditional version is mainly used in Hongkong, Taiwan, Singapore, and a several other places. 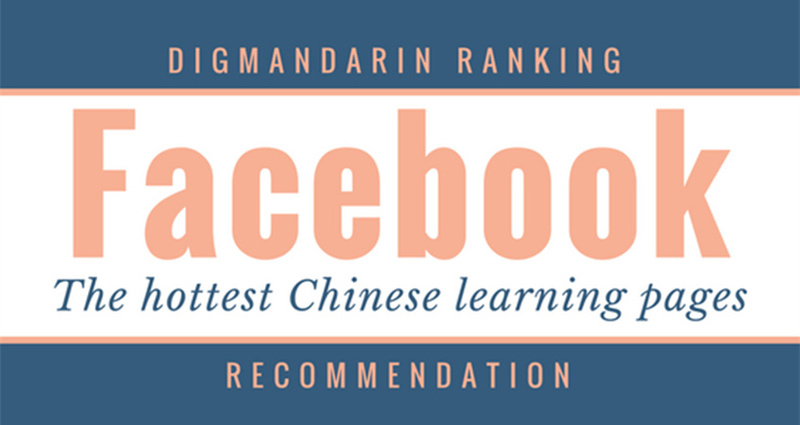 The simplified version is mainly used in mainland China. No matter which version you choose to learn, the rules of writing are the same. So, in learning how to write, the version you wish to learn doesn’t really matter. Obviously, such a large number of characters cannot be made randomly. Following certain rules, these characters which have grown over thousands of years are still very dynamic. The formation of characters seems just like a “LEGO” game! There are many small components, and you just need to put the small components together and give them order. Each of the components are made of smaller strokes. The strokes of Chinese characters refer to one uninterrupted dot or line, such as “一”（横）、“丨”（竖）、 “丿”（撇）、“丶”（点）、“乛”（折）, etc. A stroke is the smallest component of a character. There are 8 traditional fundamental strokes, which are “丶”（点）、“一”（横）、“丨”（竖）、 “丿”（撇）、 “乀” （捺）、 “㇀”（提）、 “乛” （折） and “亅” （钩）.It`s also called “’永’字八法” （yǒngzìbāfǎ）. 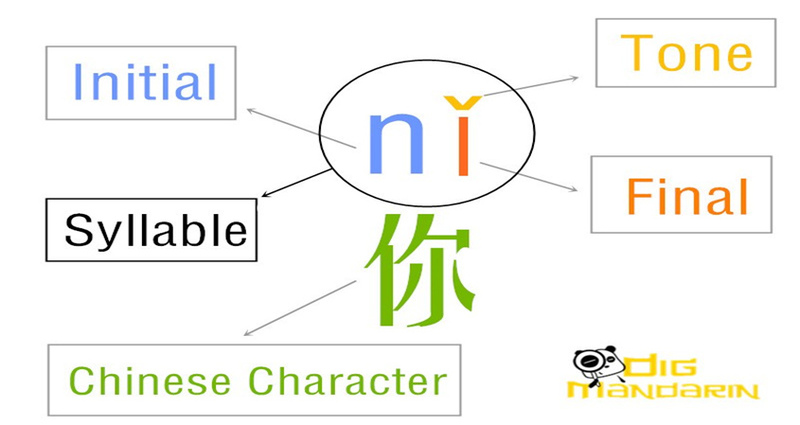 The character “永” basically represents the common stroke types of the Chinese character system. 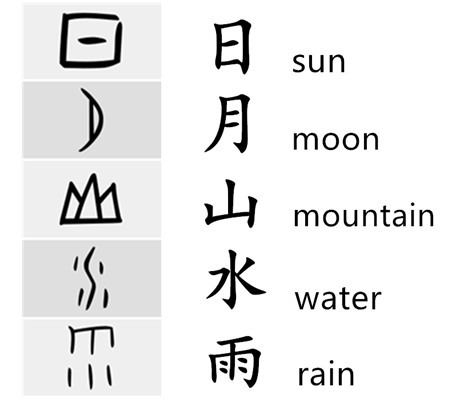 The modern modular strokes are regulated as the 5 one’s, “一”（横）、“丨”（竖）、 “丿”（撇）、“丶”（点）and“乛” （折）, and they are called “’札’字法” （zházìfǎ）. It`s a simpler version of “’永’字八法”. Radicals in Chinese characters are called 部首[bùshǒu]. 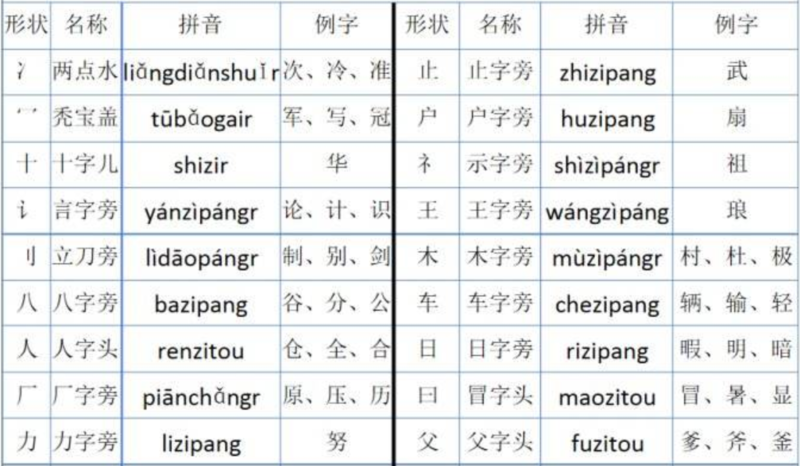 They are used to classify the character patterns which are commonly used in Chinese dictionaries. There are mainly two types of radicals depending on their different functions and properties. One is based on the principles of the six categories of Chinese characters (which we will illustrate more in the content that follows), and the other is based on the shapes of the structures. Once you understand the relations among strokes, radicals, and characters, writing characters becomes a piece of cake. Moreover, you can not only imitate drawing the shapes, but also understand the underlying rules and reasons behind the characters. Of course, practicing with understanding would be a much better way than mechanical imitation. Let`s take “女” as an example. “女” is not only a independent character which means female, but it is also a radical which can be combined with other Chinese components and indicates some certain meanings. 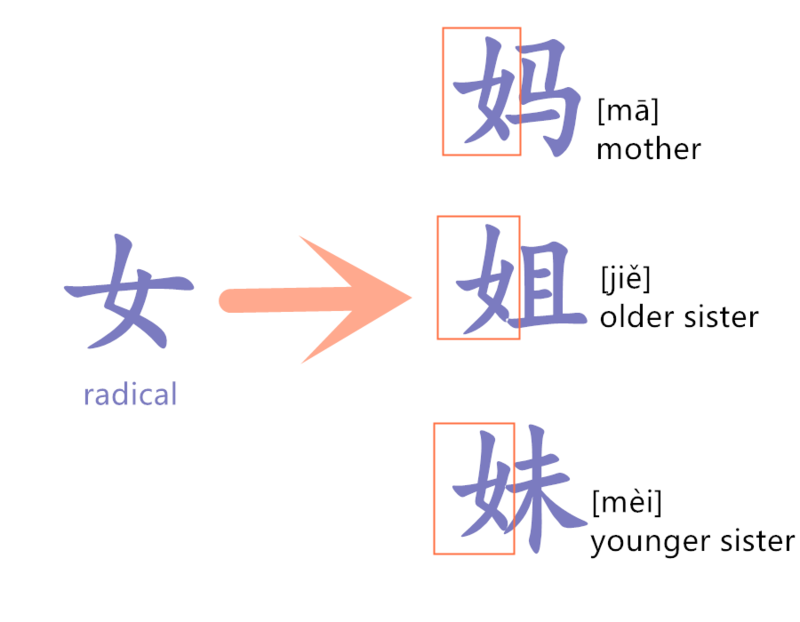 As the following picture shows, “妈”“姐”“妹” are all females, thus they share the same radical while the right sides are diversified because of the phonetics. These are stylised drawings of the objects they represent. Many Chinese learners feel that they are “drawing” Chinese characters, and in this case, they are! Most of the single characters and radicals are from this category. They are also called radical-phonetic characters. Over 70% of Chinese characters were created by this method. 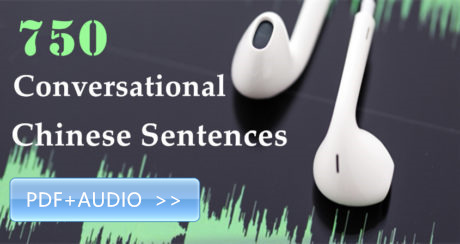 There are mainly two components: the phonetic component and the semantic component. The “女” radical we mentioned before is a typical example of this category. “妈”“姐”“妹” à“马” “且” “未” indicate the phonetic part. These express an abstract idea through an iconic form. 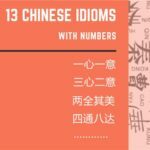 For example, the numbers in Chinese, “一” “二” “三”, are represented by the appropriate number of strokes which means “one” “two” “three”. These are the combination of two or more pictographic characters to suggest the meaning of the character to be represented. Stroke order really matters if you want to learn writing characters. Using the wrong stroke order or direction would cause the ink to fall differently on the page. The Chinese stroke order system was designed to produce the most aesthetical, symmetrical, and balanced characters on a piece of paper. Furthermore, it was also designed to be efficient – creating the most strokes with the least amount of hand movement across the page. 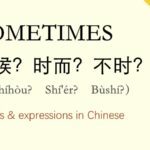 Here, I`ll quote the rules that Sara once wrote in the article Why Chinese Stroke Order is Important and How to Master it at DigMandarin to show you the proper stroke orders. When a Chinese character is “stacked” vertically, like the character 立 (lì) which means to stand, the rule is to write from top to bottom. When a Chinese character has a radical, the character is written left to right. The same rule applies to characters that are stacked horizontally. When you are writing a character that is centered and more or less symmetrical (but not stacked from top to bottom) the general rule is to write the center stroke first. There are always small exceptions to the rule, and Chinese stroke order can vary slightly from region to region. 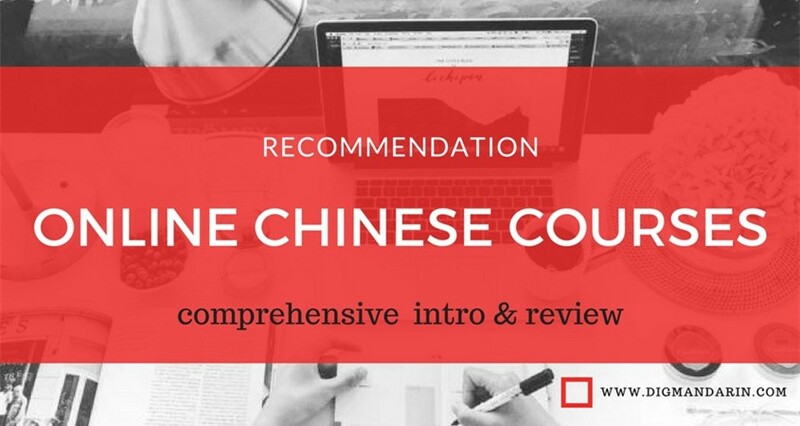 However, these variations are very miniscule; so by following these general tips, you’ll have an astute grasp on Chinese character`s writing order. From strokes to characters, this is the way Chinese characters are formed. And it should also be the way you learn to write them. Writing is not the final goal, but understanding and using them correctly. Following the order of the writing will help you remember the characters better. 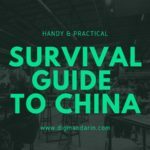 So, I hope you like this guide to learning how to write Chinese characters! get your pen and let`s start writing!